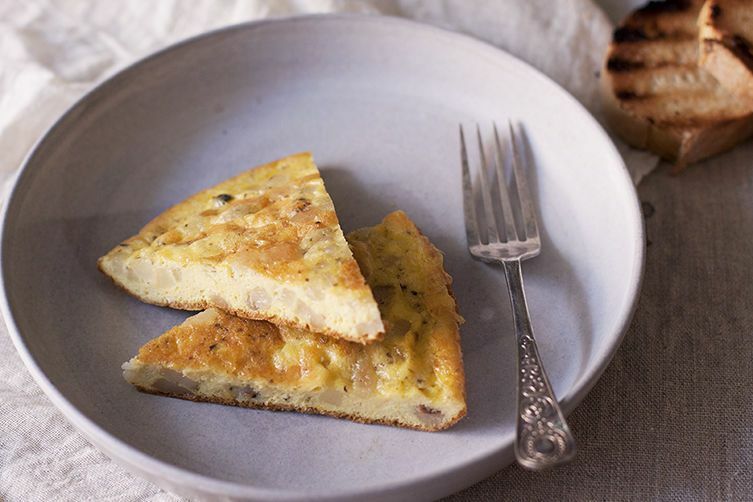 Today: Bacon and eggs just went up a notch. More: Michael Ruhlman on another fat product: schmaltz. The best lardo comes from Colonnata, a village in Tuscany's Carrara, which is perhaps most famous for its world class marble by the same name. The marble does come into play when making lardo. In order to make lardo, fatback is first trimmed of any meat (the rind is left on), until you have a perfect, white slab. Coarse salt, pepper, herbs such as rosemary and sage, and spices such as nutmeg, cinnamon, coriander and cloves are piled on, and the fat is cured for six months in vats made of Carrara marble. What's so special about the marble other than that it's the same marble that Michelangelo used to carve his sculpture of David? It's naturally porous and the caves in which the lardo is kept have their own microclimate, perfect for curing lardo without any preservatives or refrigeration. The process is pure magic. 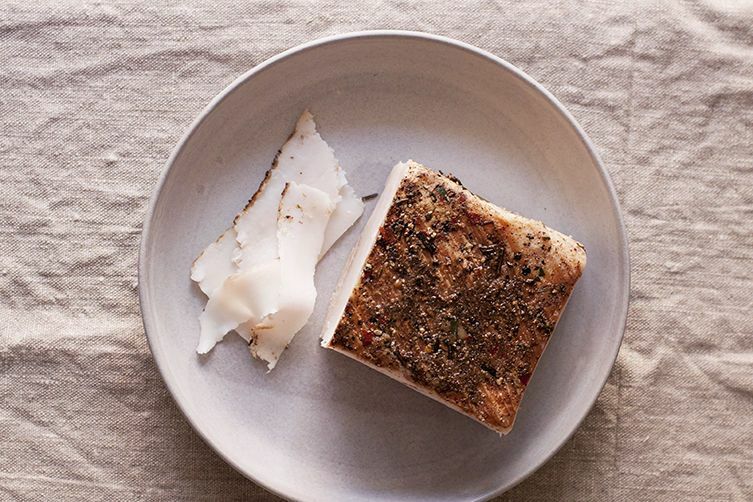 There are many things one can do with a block of lardo, but you probably want to keep it simple. As with all things rich and full-flavored, a little goes a long way. It does well fresh and thinly sliced: You can use it much like pancetta or prosciutto, pairing it simply with creamy fresh mozzarella and some sweet fruit (think ripe figs) or even honey for an antipasto platter. It's also lovely grilled or slightly warmed, which releases its aromas and gets it almost melting. Slice into paper-thin strips and enjoy it on some warm, grilled bread brushed lightly with a clove of raw garlic, where the lardo will turn ever so soft and slightly translucent as it warms from the bread. You can also purée it into a melt-in-the-mouth cream to spread onto crostini, or even purée it with basil and garlic for a lardo pesto (pesto's homeland, Liguria, is near Colonnata, after all). Or, wrap it around some roast chicken (or even better, game birds such as guinea fowl or pheasant that need some moisture). 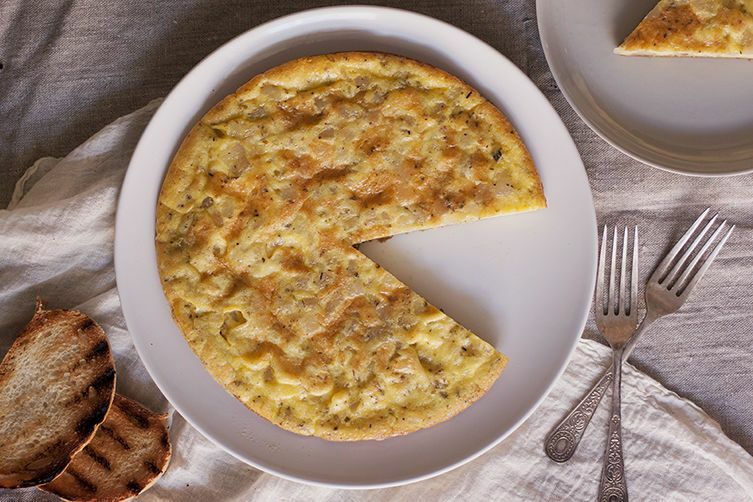 Another traditional way it's eaten in Carrara is in a rustic frittata, as you see here. You can skip the salt completely in this recipe, as the lardo and the pecorino add enough punch on their own. That would be great if you could get lardo di colonatta in America but you can't unless your local Italian guy has Really Good connections (mine does). The stupid FDA hasn't approved it because they don't think the method of preparation is hygenic. (I've made the trek to Colonatta and it's perfectly fine and the process is beautiful.) I've heard they're working on getting the approvals. It is some of the best stuff on earth but sadly American lardo isn't all that.